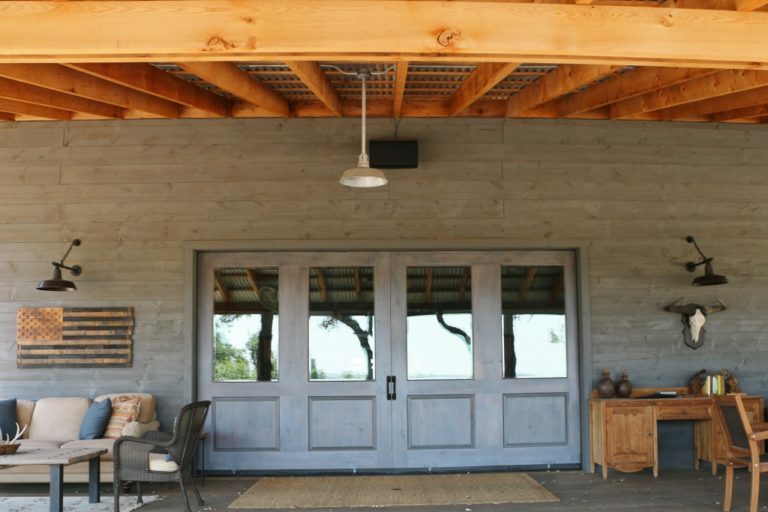 Today we’re featuring some of our favorite rustic spaces from customers who share their photos with us via our Instagram, Facebook, and Pinterest feeds. Be sure to follow Barn Light Electric on all three platforms for a continuous flow of inspiration! 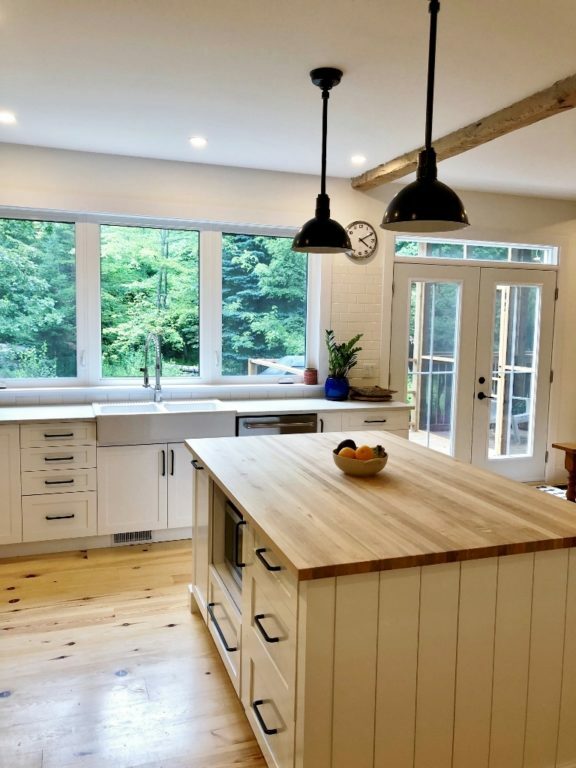 The designer of this kitchen incorporated natural elements like exposed wood beams, a reclaimed walnut countertop, and the ‘x’ detailing on the island to mimic barn doors. She also chose the Original™ Warehouse Pendant — an iconic representation of early 20th century barn lighting — to highlight the space. She customized these ceiling pendants with generous 20″ shades and a Textured Black finish. The black cloth cords add another hint of texture and vintage style. Stephanie wanted to capture the beautiful views from her kitchen so she kept the interior neutral and simple. Bright white paint and cabinetry contrast with warm wood flooring, open shelving, and an exposed beam to create a rustic feel. Lighting played an important role to the feel of the space, and Stephanie admits to spending more time deliberating the choice of pendants than any other element. The winner of her search are Wesco Stem Mount Lights customized with 12″ shades, a Black finish, and 18″ stems. You can read more about Stephanie’s kitchen project here. 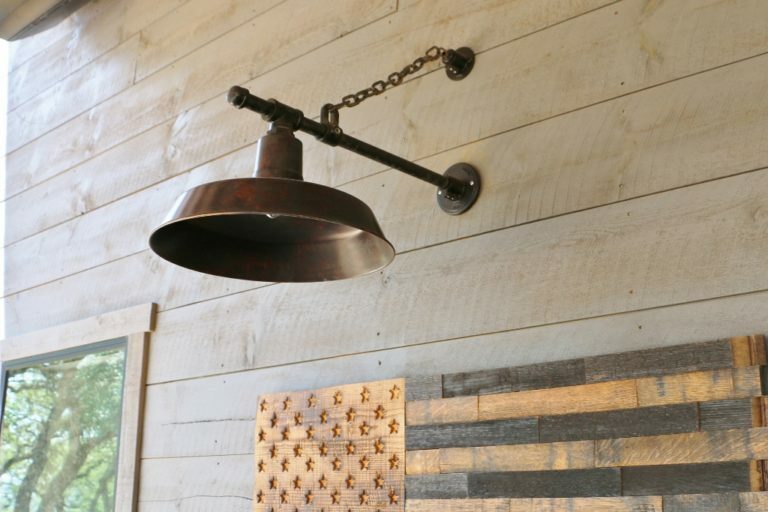 Rustic decor often includes metals mixed with wood to create the laid-back style so many people crave. 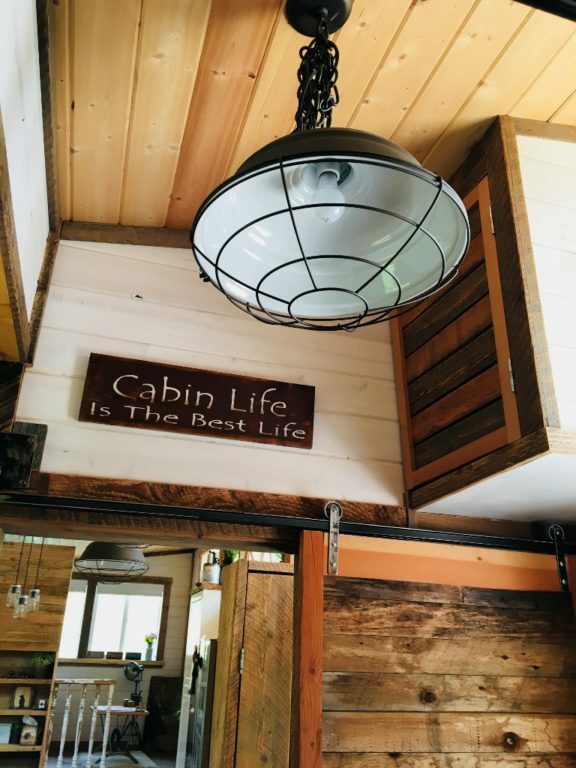 When Ron started chasing his dream of building a timber frame home in northern Idaho, his vision included chain-hung lighting over his nine-foot breakfast bar. 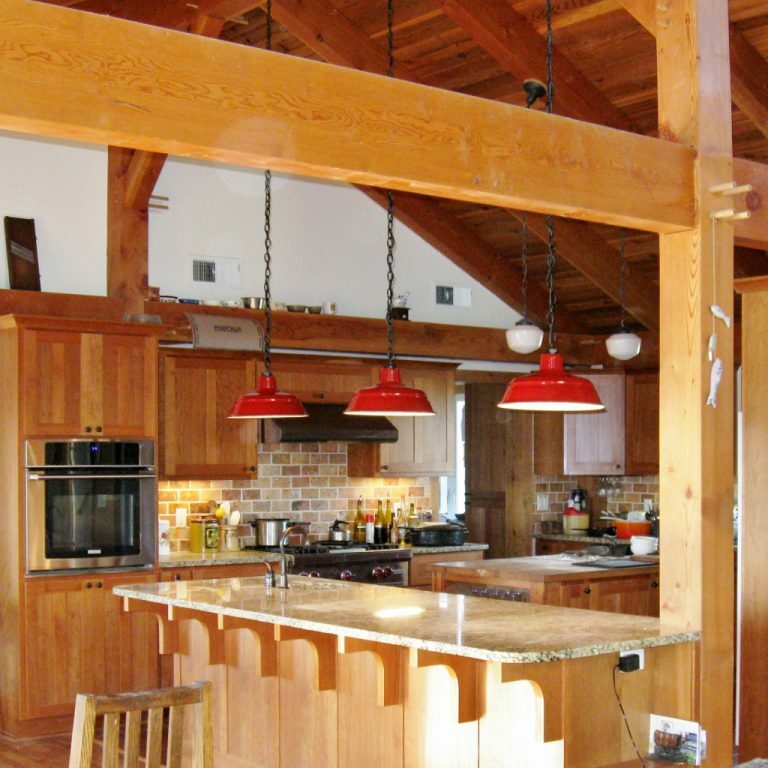 “I like that your barn lights look classic, are simple in design, and are extremely well made in the USA,” Ron notes. He chose the Old Dixie Chain Hung Pendant to highlight the kitchen’s new bar. 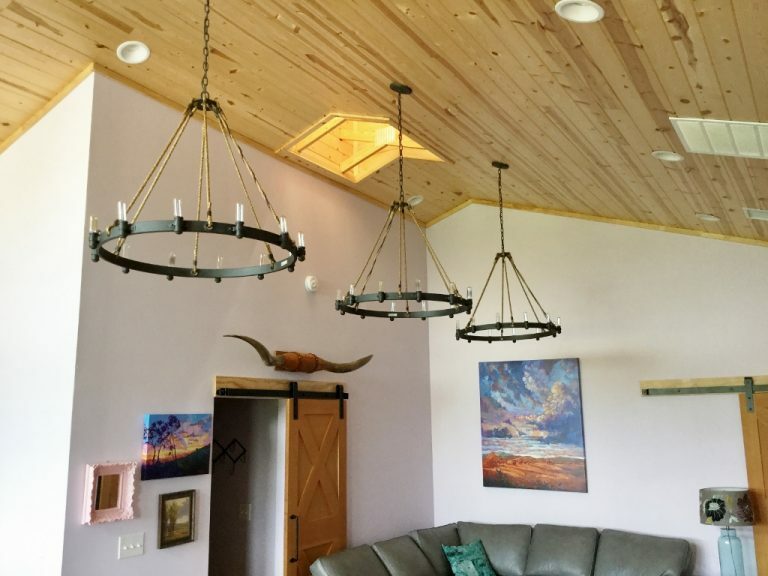 He customized these RLM-inspired warehouse lights with 15″ shades, Barn Red finish, and Black chains. 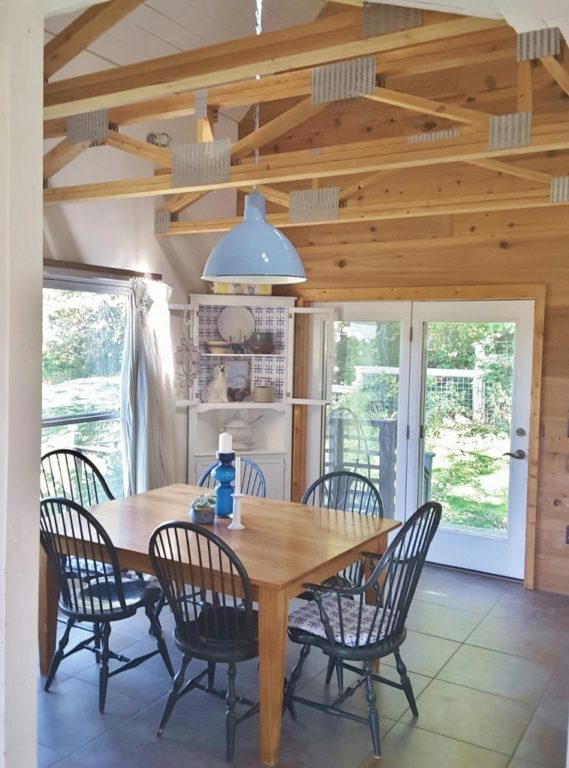 One of the rustic elements in Meaghan’s new farm home are antiques made from enamelware. She was thrilled to discover our collection of Porcelain Enamel Lighting which suited her eclectic taste. “I have old enamelware farm pieces that I treasure and here suddenly was a porcelain coated light!” she says. “I was giddy about how pretty the matching blue chain was. It turned something utilitarian into a feature.” Meaghan’s Steber Wilcox Deep Bowl Chain Hung Pendant is hand spun from solid steel and customized with a generous 20″ shade, a Delphite Blue porcelain finish, and matching blue chain. Even this tiny house, a quaint bed-and-breakfast in British Columbia, Canada, oozes rustic style thanks to plenty of reclaimed wood and rugged chain-hung pendants. These handcrafted Old Dixie Chain Hung Pendants feature 17″ shades, an Oil Rubbed Bronze finish, plus a wire cage for added rustic charm. The star attraction in this space is definitely the trio of rustic chandeliers that draw your eye to the warm wood of the vaulted ceiling. Each Outer Banks Chandelier is crafted in a 32″ size with 12 sockets finished in Shipyard Bronze. Chain hung with natural rope detailing, another hallmark of rustic design, these chandeliers exude all the farmhouse feels. 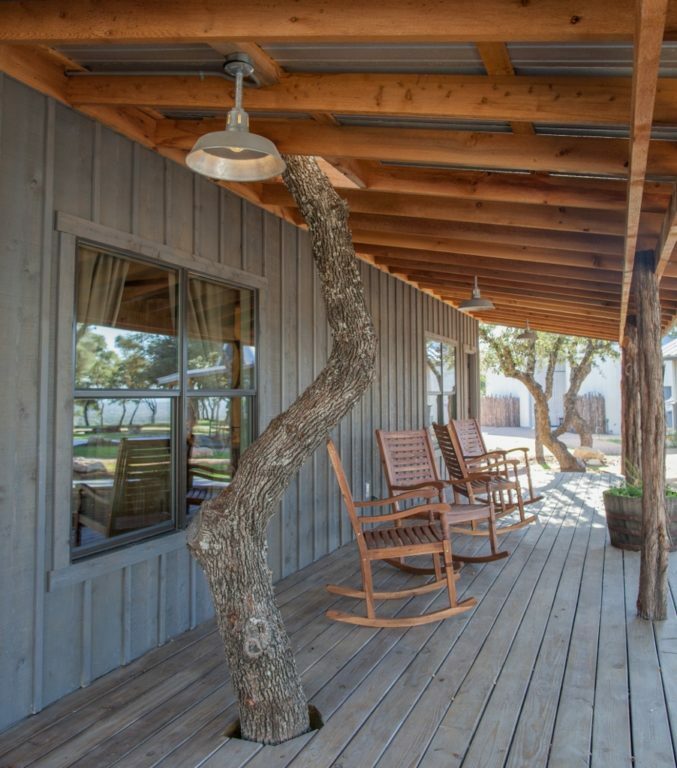 And finally, we venture out to the Texas Hill Country where this new ranch home embraces the rustic nature of the land that surrounds it. 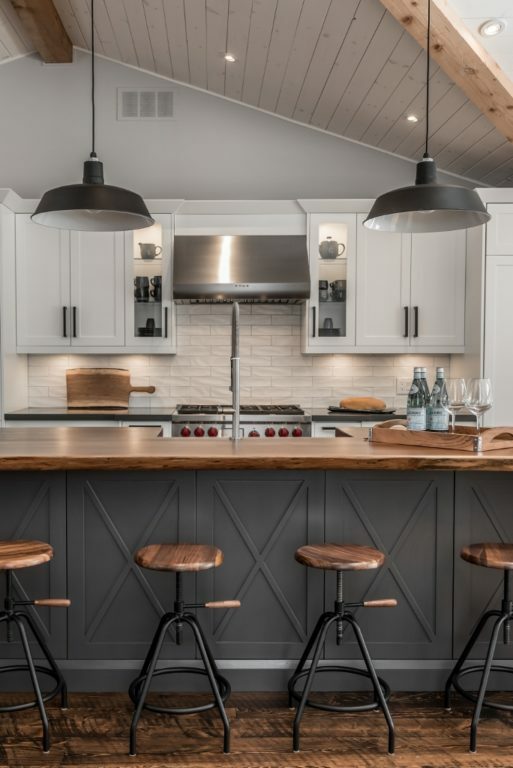 Jennifer chose one of our most popular shade styles — the Original™ in both gooseneck lights and pendants — to provide the classic, comfortable, and rustic feel the homeowners envisioned.